The Delta Dugout New York Yankees Sweepstakes is open only to legal residents of the fifty (50) United States and D.C. who are eighteen (18) years of age or older. 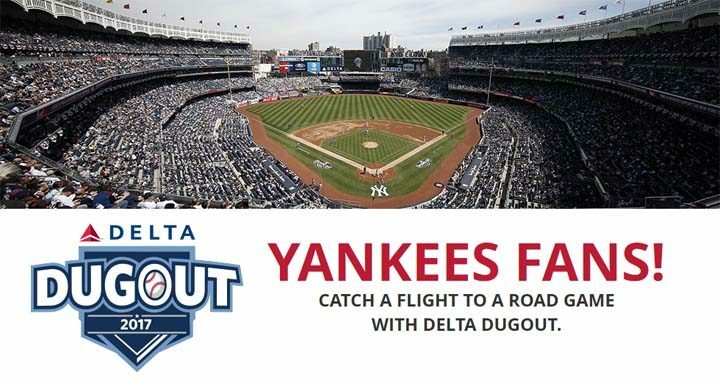 The Delta Dugout New York Yankees Sweepstakes ends at 11:59 PM ET on September 22. Go to Yankees.com/deltadugout and click on the Sweepstakes banners, buttons and/or links to access the online entry form. Limit one (1) entry per person/email address/household. Forty Trigger Events Prizes: Four (4) Forty Trigger Events Prizes will be awarded. Each applicable Trigger Drawing Winner will receive a pair (2) of tickets to a 2017 regular season New York Yankees home game determined by the Sponsor at its sole discretion. (ARV of each Forty Trigger Events Prize: $100.). Fifty Trigger Events Prizes: Four (4) Fifty Trigger Events Prizes will be awarded. Each applicable Trigger Drawing Winner will receive one (1) gift card to the New York Yankees Team store valued at $50. (ARV of each Fifty Trigger Events Prize: $50.00.). Sixty Trigger Events Prizes: Two (2) Sixty Trigger Events Prizes will be awarded. Each applicable Trigger Drawing Winner will receive one (1) domestic round-trip travel voucher for two (2) on Delta Air Lines. (ARV of each Sixty Trigger Events Prize: $1,200.00.). Seventy Trigger Events Prizes: Four (4) Seventy Trigger Events Prizes will be awarded. Each applicable Trigger Drawing Winner will recieve autographed memorabilia signed by one (1) New York Yankees player or alumni determined by Sponsor at its sole discretion. (ARV of each Forty Trigger Events Prize: $100.00.). ARV of each Seventy Trigger Events Prize: $2,560.00.